← Also in the mail . . . The field campaign is in high gear and we are walking precincts all over town (this weekend, District 8, District 9 and District 3). I want to give a special shout out to my mom, Betsy Powell, and her friends Adella Harris, Sue Lyon and Sue Chase. This group of longtime friends (all members of the Berkeley High class of 1960!) walked all over Bernal Heights this morning leaving literature for voters. Thanks, ladies! Tomorrow (Sunday, Oct. 19) we will have a table all day at Fiesta on the Hill on Cortland St. in Bernal Heights – stop by and say hi if you are around! Oct. 25 – Cole Valley – 10 a.m. ; fuel up with bagels and coffee and then walk precincts in Cole Valley! For details and to RSVP, email events “at” rachelnorton.com. 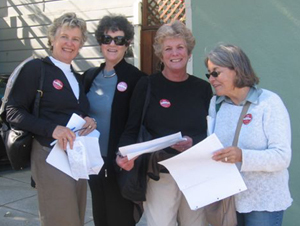 Oct. 26 – Noe Valley – 12 – 3 p.m. ; For details and to RSVP, email events “at” rachelnorton.com. Nov. 1 – 3 – Locations TBA; Can you give an hour or two to walk a precinct for us? This will be the last weekend push and we need all the volunteers we can get! Call 762-0721 or email events “at” rachelnorton.com if you can donate a few hours on one of these days. This entry was posted in Campaign and tagged GOTV. Bookmark the permalink. WE ALL VOTE FOR YOU !!!! !